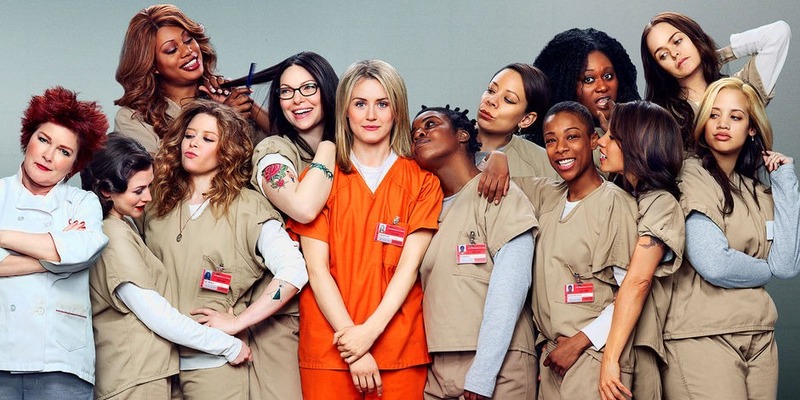 Orange is the New Black is easily one of the most successful TV shows in Netflix's original programming lineup. The show currently has four seasons and has already been renewed for an additional three. Show your love for the show by throwing your own OITNB-themed party with these ten easy and fun party games and activities. 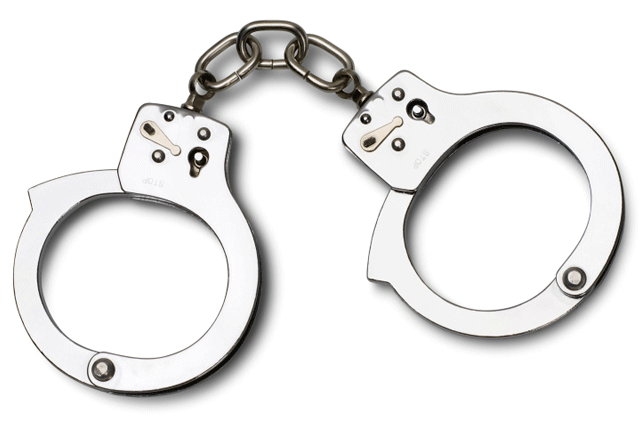 At the start of the party, give each guest a pair of handcuffs and a code word. Choose common party words, like 'party' and 'beer', and/or words common to the show, like 'orange', 'inmate', or 'warden'. If you hear someone say your code word, it's time to channel your inner evil warden - the person who said the word has to wear their handcuffs and stay silent for ten minutes. Keep an eye on your prisoner - if they cheat at all, their time in "solitary confinement" will be extended! To avoid angry guests, be sure to keep the handcuff keys safe so you can set them free after the time is up. In the first season, before her commissary money came in, Piper had to take desperate measures to avoid foot fungus in the shower by using sanitary pads as makeshift shower shoes. She soon found that another inmate, Sophia, had had a better idea. 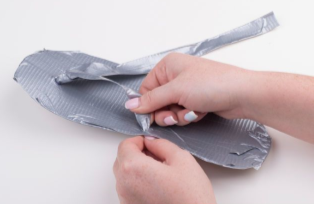 Take a page out of Sophia's book and have your guests create their own duct tape flip-flops. All you'll need for this craft are scissors, cardboard and duct tape. Your guests can keep them plain silver and "couture" like Sophia's pair, or personalize them with colored duct tape and Sharpie markers. If your guests are feeling brave, have them wear their creative footwear for the rest of the party! Before the party, cut out a picture of prison contraband (a pack of cigarettes, a screwdriver, etc) and glue it onto a piece of cardboard. Next, choose one guest to be the 'warden', and have the rest of the guests sit in a circle, playing the 'inmates'. While the warden waits outside the room, the inmates pass the contraband around the circle. When the warden yells 'stop', the person who has the contraband must quickly hide it (underneath them, in their shirt, etc). The warden can then choose up to three inmates to 'interrogate'. If they correctly choose the person with the contraband, the warden wins a prize. If they don't, the person who had the contraband wins a prize. Play a few rounds to allow multiple people to play the role of the warden. 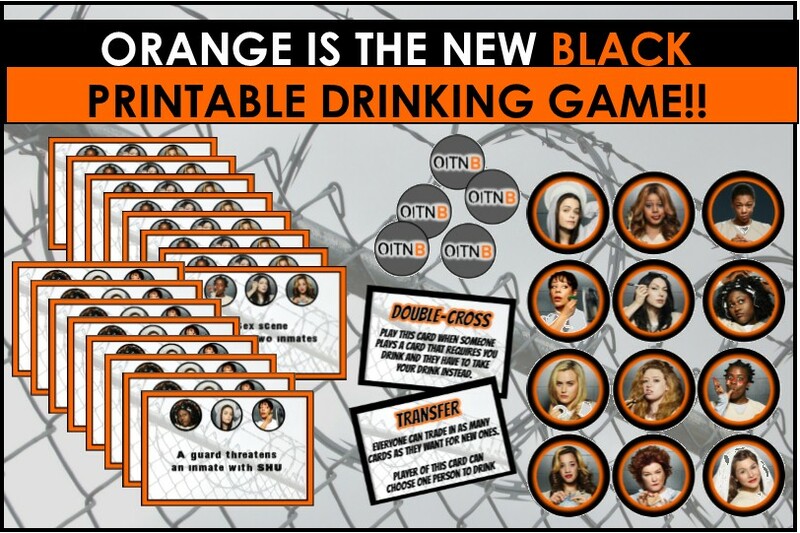 If you and your friends love drinking together and OITNB then this drinking game is perfect for you. Unlike regular drinking games where you all drink from the same random list of drinking cues, this game is a little different. Each player receives several scenario cards, and when they see one of those happening on the screen they can play the card and pick another player to take a shot. 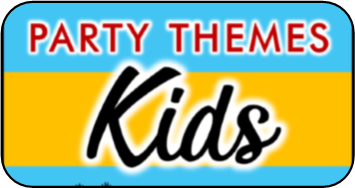 This is a PartyGamesPlus.com exclusive game! 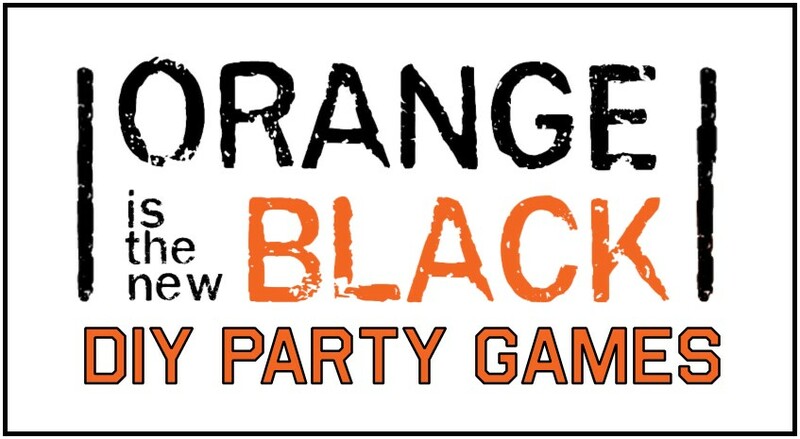 OITNB fans will love this twist on a classic game. Before the party, write the names of characters from the show onto pieces of paper and place them in a hat. At the party, split the group into teams and have each team choose one person to act. The actor will choose a character from the hat, and their group will need to guess the character they're imitating (following normal charades rules). If the team guesses correctly within the time limit, they earn a point. Repeat until every team member has had a chance to act. OITNB is often praised for being a show with a large and diverse cast of characters, all with big personalities. Choose and print out funny or memorable quotes from various key characters in the show. The goal of this game is to guess which character said each quote. You can take the game a step further by having them also guess to whom the character said the quote. You can play this game individually by showing every person a different quote, or split the group into teams and have them work together. 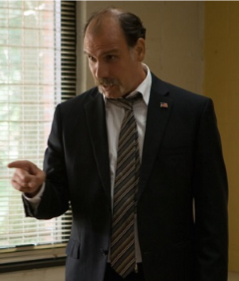 In the show, various reasons are presented as to why each of the characters ended up in jail: from drug charges, to stalking, to protesting a nuclear testing site. Before the party, create a list of reasons from the show, and leave a blank line next to each one. Each person will fill out the spaces with the name of the party guest who would be "most likely to" go to jail for that reason. Later, tally up the results and give out joke certificates or ribbons for each category. This game is quick and sure to lead to a lot of laughs. 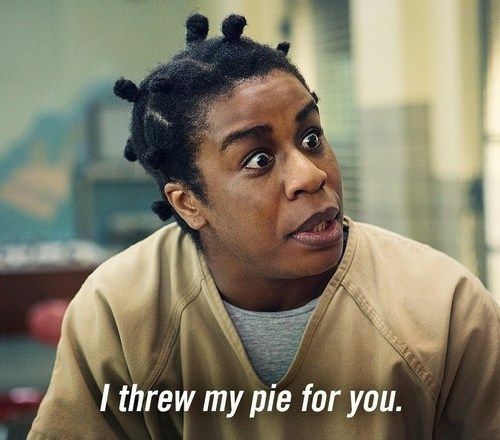 In the first season of the show, Suzanne "Crazy Eyes" falls hard for Piper, writing her love poems and calling her 'Dandelion'. Split the group into pairs and have them gaze into each other's eyes while reciting the most wacky love poems or pickup lines they can think of. They can also come up with their own ridiculous pet names for each other. The first one in each pairing to laugh is out. 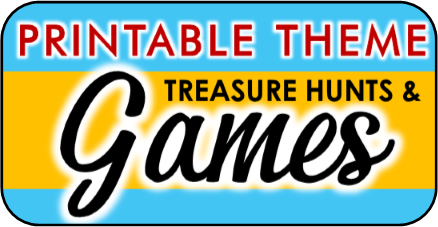 Pair up the winners with each other and continue the game until only one player remains. 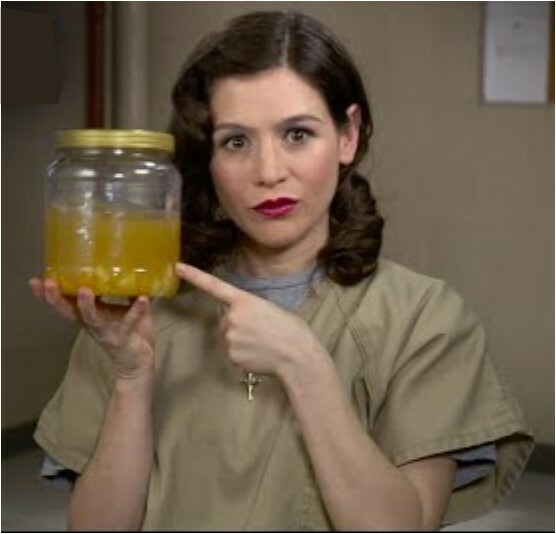 The girls at Litchfield Penitentiary have to be very creative if they want to drink - they combine fruits, sugar, milk, and even ketchup to create their own "prison wine". Challenge your guests to create their own fake prison wine by combining at least three ingredients into their own drink creation. Provide different chopped fruits, juices, liquors, and any other mixes you can think of. The goal is for your guests to get creative, but you definitely want the finished products to be tastier than real prison wine! As a bonus, you can then use the drinks you create to play a drinking game. Through flashbacks throughout the show, we learn about each of the inmate's pasts, and what landed them in trouble outside of the prison. Have your guests think of a memory from their own pasts to create their own 'flashback'. The memory could either be of an embarrassing moment, or of a time that they got into some trouble. Each guest will write down their 'flashback', to be later read aloud by the party host. You can either keep the memories anonymous, or turn it into a game by having everyone guess which memory belongs to which guest. 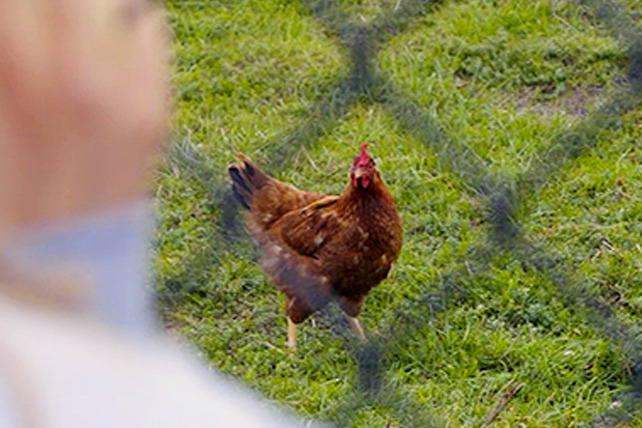 At first they said the chicken was an illusion, an urban myth - but we have all seen the chicken. In this game you will need to print out about 10-20 chickens. It can be the same chicken image. The image should be about the size of your fist. Hide the chicken image around your party area and tell guest when they spot one to take it and hold onto it. At the end of the party whoever has found the most chickens wins a prize - maybe some chicken lol.